Chief Minister Prem Kumar Dhumal dedicated newly constructed Police Station building at New Shimla. While addressing the gathering he assures for a Primary Health Centre in New Shimla. Chief Minister said the State Government was giving added priority to roads, health and education and many miles stones had been setup in these fields during last four and a half years. 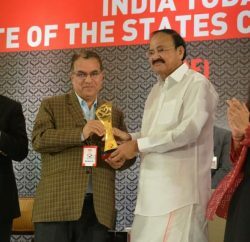 He said that the present Government had been conferred with 60 awards which speak volumes about the progress the State had made in almost all the sectors during last four years. He said that these awards had been given to the state by Independent surveys conducted by various prestigious National and International agencies. The State had excelled itself in the field of Tourism as a record 1.5 crore tourists visited the State in 2011-12 and had almost 4.85 lakhs foreign tourists. He said that the State was heading towards becoming educational hub of the country. 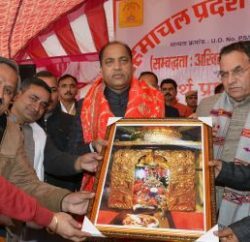 Prem Kumar Dhumal said that every section of the society, especially poor and weaker sections has been benefitted from the policies and programmes being implemented by the State Government with laying special emphasis for the welfare of common man. He exhorted people to extend their wholehearted support in the developmental process and make people aware about the welfare schemes being implemented in the State so that people living in the far-flung areas were benefitted. The Chief Minister lauded the efforts of the Resident Welfare Association, New Shimla, which was doing commendable job for preservation of environment and keeping their surroundings clean. Chief Minister said that the senior citizens and educated lot should come forward to help eradicate social evils from the society and create awareness amongst general masses. He also assured to provide adequate funds for the construction of link road as per demand raised by the local residents, provided the land was donated for the same. Earlier, the Chief Minister dedicated Police Post building at Sanjauli constructed at a cost of Rs. 27.65 lakh. 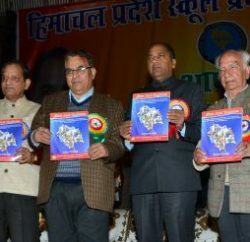 Virender Kashyap, MP while speaking on the occasion said that the present government under the dynamic leadership of Prof. Prem Kumar Dhumal had setup many miles stones in various fields of development which had been recognised by the Central Government too. Suresh Bhardwaj, local MLA also spoke on the occasion and exhorted people to extend their cooperation in implementing Government policies and programmes in the State. Ganesh Datt, Vice Chairman, HIMUDA also spoke on the occasion and supported the demands raised by the local residents. Bimla Kashyap, MP, Veena Thakur, Chairman State Social Welfare Board, Rupa Sharma, Vice President State BJP, local Councillors, and other dignitaries were present on the occasion.